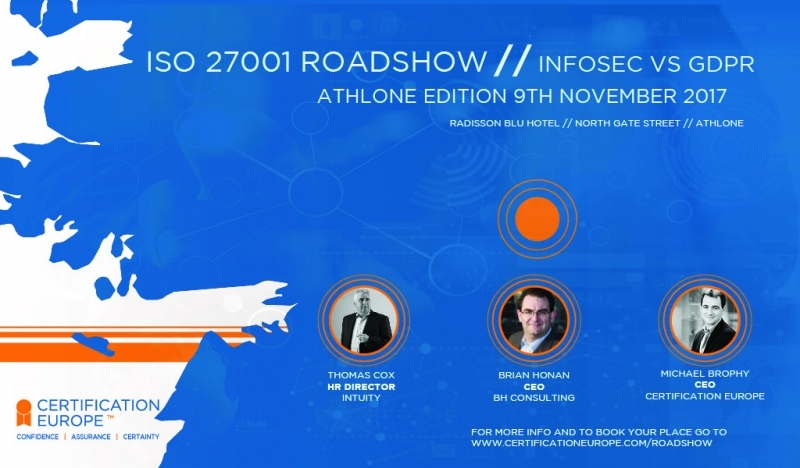 Home » News » Are you interested in how information security, GDPR and ISO 27001 are shaping the business landscape today? Join us on November 9th at Radisson Blu Hotel Athlone, Northgate Street, Co. Westmeath. Join our panel of experts as they tell the full story of what information security management entails for your organisation. There are 4 events over the course of October & November. All events are free and are for the purpose of informing delegates of current trends in Infosec, how GDPR will affect them and what systems and frameworks (namely ISO 27001) can do to help them comply with the regulation.